One answer is to become a great content curator. Plenty of business websites and blogs are making lists this time of year, reflecting on the past 12 months as well as predicting what 2012 has in store. There’s something about seeing a sorted collection of useful information that motivates people to read and socially share. A well-sourced and thoughtfully-written list can evoke a strong emotion that inspires commentary and engagement. Like them or not, credible, sorted lists and collections of resources are powerful blog content and social media marketing tools. Unfortunately, many marketers are overusing the same old tactics ala “link bait” for a quick hit and not looking at the longer term benefits or impact. Through trial and error, we’ve made the same mistakes but with good web and social media analysis, we’ve been able to make some great improvements. Who doesn’t want to increase traffic and engagement in their blog and social media marketing programs? I thought so. Here are three types of curated lists and resource collections bloggers can use to efficiently create useful content that attracts, engages and inspires their readers to action. Think of much needed resources in your industry. Are there tips, how-to’s, reports, examples, tools, events, networks, or something else that could be aggregated and made useful? Think about different formats including text, image, video, audio, or something interactive. Use bookmarking to save interesting things as you go vs. trying to create a list in a single effort. I have 20-30 categories of resources I add to every few days. Spread your resource collection effort over time and across your team when researching larger collections. You can also crowdsource them from your own social network. What exists in your industry that’s highly valued but not easy to find in one place? Bring those things together in a list. Also, think about what you can do to creatively involve your community with the sorting of the list. What can you do visually to make your collection stand out? While you’ve seen many lists of the most popular individuals for a particular category (especially in the social media realm) on just about every blog online, they fact that many of them are arbitrary or playing industry celebrity favorites means there’s tremendous opportunity to do something unique and more interesting. What are the best UK Online Marketing Blogs? 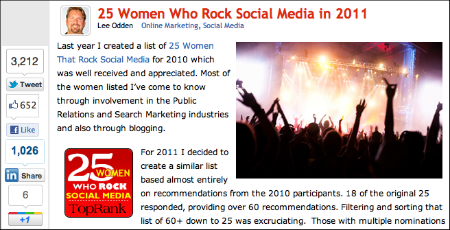 Some of these lists are a one time effort, but some of them are annual, such as the Women Who Rock Social Media list. Qualitative lists inspire those included to help promote and with a collective effort more exposure to the list brings more attention to each individual. The key is for the list to be relevant, well sourced and written. Another way to include disparate, useful resources into one collection is through crowdsourcing. By that I mean asking a group of subject matter experts the same question or similar questions and curating the results into one, topically specific (and keyword optimized) list. You could also make sure that when you interview industry experts, that some of the questions are the same same for all interviewees. Then you can re-purpose the different answers to single questions as a meeting of the minds post that brings together different, well-respected thought leadership in a single topic. When asking well known and influential people to contribute, be respectful of their time and make it easy to contribute. Don’t ask for them to write War and Peace. Ask one simple question via email and offer to capture it verbally over the phone/Skype if that works better. When you publish the curated collection of tips, be sure to give participants an individual (as in personalized/unique) heads up that the list is published as well as to thank them for their participation. Recognition is important to everyone, whether they’re well-known or just starting out. Surely there are unrecognized people or resources in your industry. What or whom could you recognize in an original and thoughtful way that aligns well with your own unique selling proposition and key message? If your business sells Kindle Fire Cases, then couldn’t you curate a list of Kindle resources? Clever reasons to use a Kindle case? Book suggestions from Authors? Game, App or Movie reviews? Use a metaphor in your list title that includes target SEO keywords: Authors on Fire: Kindle Style, One the Case with Kindle Apps. They’re not a direct match, but that’s the art and science of SEO copywriting – a topic for another post. As with any marketing endeavor, think about the purpose and intended outcome of your list first. What search keywords and social topics represent interests, needs, and goals of the influencers and end customers that you’d like to connect with? Pick a topic and stick to it. Sourcing. As you understand your community, what are the unmet needs in information that you could satisfy? What unrecognized individuals or companies with powerful networks could be resources for, or included in the list? How will it fit in and complement your content marketing and social media strategy? Incidentally, I have an entire book dedicated to this topic coming out in March. Creation. Put qualitative effort into creating your collection or list. Make it special, useful, and unique. Make it snarky or funny and by all means, make it shareable! Gimmicks are not nearly as important as quality and relevance to the community you’ll be promoting to. That said, you do need to think of what will make your collection promotable. Great content isn’t great until it’s consumed and shared. Repurposing. Lists of things like people, books, reports, quotes, or just about anything can be repurposed as a PowerPoint on SlideShare or made into a video with bumper messages, narration, and music to be promoted on YouTube. If you’re smart about sourcing and making the collection promotable, then don’t just do it once. Plan on making the list annually, quarterly, or monthly. Understand that with collections and lists, people and companies have an inherent desire to be included and recognized. At the same time, lists are exclusionary, so offer your readers an opportunity to add to the list you’ve created. Encourage them to participate and think about the group social needs, not just your own. A qualitative approach that focuses first on relevance of a collection to the community you’re promoting to will result in much better reach and engagement for you. By the way, if you like this post, then you’re going to LOVE this book: Optimize. Published by Wiley, it will come out mid-March this year and is full of ideas, tips and insights. A distant version of this article originally appeared on my Social Media Smarts column for ClickZ. Lists are one of those great evergreen content item types that just keep giving, but I’ve found they are also a great way to stop wasting time and avoid duplication of effort as well. Clients and industry friends had asked me for years about finding stock photography for use in blog posts and site design before I wised up and created a mega list to point them to. I was going to my bookmarks and typing out replies each time. And while I could have simply created a templated email response, that wouldn’t hold the same potential. I created one short list for clients and one ‘all in’ mega list for web geek and blog friends on one of my personal blogs. I could have used affiliate links, but to me the value was in having one place to point people to. One unexpected benefit was all the new sites I discovered while clearing out old dead ones. Here is said 49+ stock photography sites mega list. Enjoy. Useful list and nice segue to the link (which was fixed & made into an anchor text link) Kevin. The process you went through with the stock photography list was the same I used for our BIGLIST of search marketing blogs. Same for our list of RSS & Blog Directories. One thing to be aware of though: When people create such lists, be prepared to succeed. 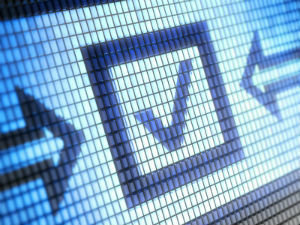 Topically, the list should mirror the theme of the site vs. something fringe and more popular. If the list does become the industry “go to” resource, it will attract a large amount of traffic and if the topic isn’t in synch with the purpose of the site, that creates a bit of a disconnect for users and for search engines. Thanks for changing the link Lee. I totally agree and have no excuse outside of the cliche’ client work comes first, so do as I say not as I do. I know…I know. Thanks. social media marketing? Please some body explains. Good question Michael. What do you think social media marketing is? Thanks Lee, just bookmarked that Big List you’ve shared. Everyone is an author these days so content curation is put to the test here. Now, I wonder if we can run the hunt for the next great content curator, like some reality TV show.. just one of the crazy ideas you get from watching too much.. Have an awesome week then! Thanks Aaron – there’s a list idea: Best content curators for different topics 🙂 Not an entirely new idea but interesting considering the diversity of tools and ways one can curate now. Funny thing is, if a person is diligent about bookmarking and organizing those bookmarks, the result can be some pretty impressive collections 🙂 Thanks Laura. Quite an eye opener about curation….Lee. Out of the 3 types of curated list methods, which is the most productive in your experience? Good question Shefiu. The simple answer is that people lists tend to inspire more social engagement and resource collections tend to attract more links. Both attract social shares. But there’s so much more value than that. Evaluating content return on investment like this would be a great topic for another post. I might have a list of people I’m recognizing that doesn’t get much play in terms of shares or links but putting an individual on that list might help them recall who I am the next time we meet at an event, which could prompt a conversation which could turn into another and then a referral for consulting, speaking or training. No matter what, the recognition and inclusion must be based on qualitative measures. It doesn’t work (or make sense in my opinion) to put people on a list just to get their attention. They need to deserve and earn it. Measurement in terms of productivity should probably happen at intervals all the way out to several years from the original post date depending on how popular the list is and how well it attracts search traffic. I have lists that too 10 hours to do but have delivered 10’s of thousands of relevant visitors each year for 4+ years. That’s a pretty healthy return on effort. When measuring effectiveness of content marketing it’s important to look at several dimensions and timeframes – all based on your original goals, plus any icing on the cake that might happen like a journalist interview or a paid speaking gig. This is very interesting! In our business, we really need to focus on two main areas: getting new clients and looking after current clients. Unfortunately most of the organizations these days are fast paced to invest their time and funds concentrating on the purchase to new clients that they overlook their current ones.